Texas Tech was supposed to beat Oklahoma State on Wednesday night. Of course, that’s the whole reason the words “trap game” were invented. And Gallagher-Iba Arena has been a house of horrors for the Red Raiders for more than a decade. Entering the game Texas Tech (20-5, 8-4) had lost 14 of its last 15 games at GIA, with only a win in 2016 to show for that stretch. Well the Red Raiders stomped on those demons, handing Oklahoma State a 78-50 loss that was absolutely dominant. 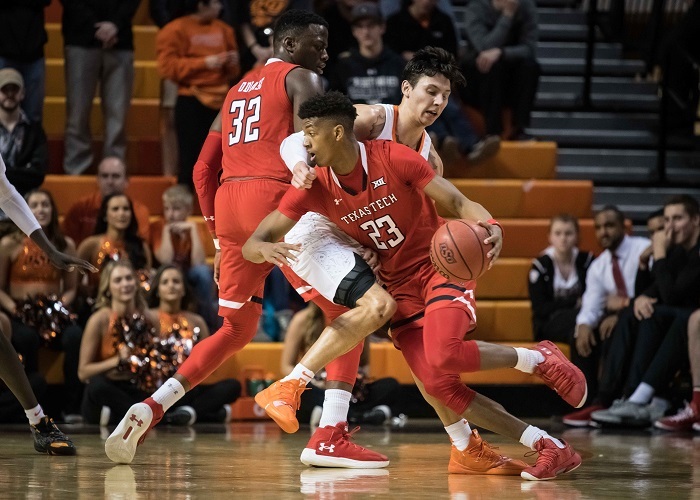 Against Oklahoma State (9-15, 2-9) the Red Raiders overwhelmed the Cowboys with one of their best shooting nights of the season. For most of the game the Red Raiders shot better than 60 percent from the floor and more than 50 percent from the 3-point line. The latter stat line is significant in that Tech makes about six 3-pointers per game and shoots 34.5 percent from there for the season. Tech ended up with 12 made 3-pointers and shot 48 percent from the arc. Overall the Red Raiders shot 51.8 percent from the floor. Meanwhile Oklahoma State shot 37 percent from the floor and 22.2 percent from the 3-point line. It was over by halftime. Texas Tech head coach Chris Beard was able to empty his bench as the Red Raiders won their fifth game in their last six. And this came after losing three straight in Big 12 play. Jarrett Culver ended up with 19 points, Matt Mooney with 15 points and Tariq Owens with 11 points. Mooney was 5-for-5 from the 3-point line. Norense Odiase had 8 points, 3 rebounds and a charge. There isn’t much to say about Oklahoma State at this point. We all know they’re operating at least four players down due to player dismissals. Cameron McGriff is doing tremendous work despite the fact that the team’s bench is so short. McGriff ended up with 18 points. Guard Lindy Waters III had 14 points. There is a foundation here, though. The entire starting lineup should return next season. So should the team’s two primary bench players, Duncan Demuth and Curtis Jones. And head coach Mike Boynton Jr. has been working the recruiting trail big time. If you can’t read the fine print, the Cowboys have the nation’s No. 13 recruiting class according to ESPN.com. That couldn’t come at a better time for Boynton and the Cowboys. In golf, they call Saturday “moving day.” Well Saturday could be moving day in the Big 12, with two huge games on the docket. Front-running Kansas State has a 3 p.m. meeting with Iowa State. Baylor, Kansas and Texas Tech are all rooting for the Cyclones to win. Heck, the Cyclones, two games back in the Big 12, are rooting for themselves. A win over K-State gives Baylor, Iowa State, Kansas and Texas Tech a fighting chance to come back to at least claim a share of the Big 12 crown because it would cut K-State’s league lead in half. An Iowa State loss likely eliminates the Cyclones from contention. A win strengthens Kansas State’s handle on the Big 12 lead. Meanwhile, Texas Tech hosts Baylor in another “elimination game.” Both are two games back of Kansas State in the standings and the loser is likely out of the running for the regular-season crown. Tech is looking to avenge its loss to the Bears last month. Oklahoma travels to TCU trying to end its free-fall. Kansas hosts a woefully undermanned West Virginia team and Texas looks to bounce back from its loss to K-State when it hosts Oklahoma.